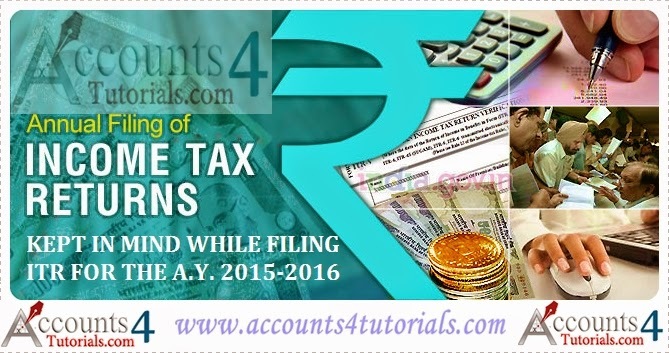 ITR-1 (SAHAJ) & ITR-4S (Sugam) cannot be filed by individual who has earned any income from source outside India. Introduction of EVC for verification of return of income filed as an option to send ITR-V to CPC, Bangalore. Super Senior citizens are now allowed to file ROI in paper form even though their income exceeds Rs 5 lakhs subject to other conditions. Introduction of furnishing Aadhar Card Number in ROI. Which will be used for EVC system introduced as mentioned above. Details of all bank accounts with Bank name, IFSC Code, Name of Joint Holder, if any, Account number, Account balance as on 31.03.2015 mandatorily to be provided. Even those accounts which are closed during the year. Details of Foreign Travel made if any (For resident and non resident both) includes, Passport No, Issued at, name of country, number of times travelled and expenditure. Details of utilization of amount deposited in capital gain account scheme for years preceding to last two assessment years. Particulars asked include year of utilization, amount utilized, amount unutilized lying idle in capital gain account scheme till the date of filing of return of income. For Non-resident, Income from other sources, If any income chargeable to tax at special rate provided in DTAA, It is now required to provide details of Name of Country, Relevant article of DTAA, Rate of Tax, Whether TRC obtained or not?, Corresponding rate of tax under income tax act. Foreign Bank accounts details: It is now further require to furnish Account number, account opening date, Interest/income accrued from such account, If any along with details of head of income and schedule under which such income is shown, if offered to tax in India. In similar manner, details of income from financial interest in any entity outside India along with details of income offered to tax in ITR-2 from such income.